Sharing painfully earnest high-fives with strangers is a rarity on the impersonal confines of the E3 show floor. But in 25 short minutes, three other players and I, brought together by the hands of fate (or rather the hands of a game studio PR person), had just slain the mighty Kraken in a thrilling back-and-forth match of Evolve. I fought off the urge to buy my teammates a round of drinks over which we would tell stories about the Big Hunt while the polite bearded man who’d been controlling the creature put down his PlayStation 4 controller and slunk away in quiet defeat. The game industry has bounced around the term “asymmetrical gameplay” a lot in the past couple of years to describe games where players will have different experiences while they play together. The Wii U, Nintendo insisted, was supposed to advance this brand of play, because the player using the tablet controller has the advantage of the built-in second screen over those stuck with Wiimotes. But aside from the mild fun of spooking human opponents as a ghost in Nintendoland’s Luigi’s Ghost Mansion mini-game, asymmetry still felt like a novelty. I didn’t fully appreciate what a well-designed asymmetrical game could do until I took up virtual arms in Evolve. 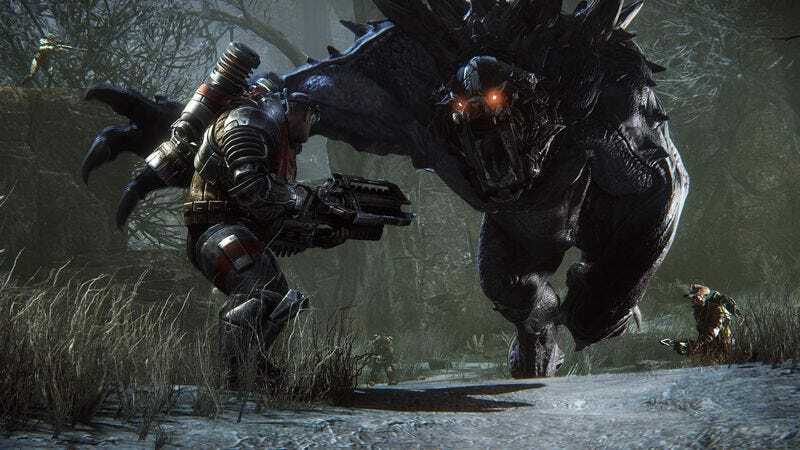 Evolve is the brainchild of Left 4 Dead creators Turtle Rock Studios, and the fingerprints of that multiplayer shooter are smudged all over it. A team of four humans playing online must use cooperation (and large guns) to slay enemy creatures—well, make that creature, in the singular. For the human team, dubbed Hunters, your job is quite simple: Kill the monster. Each player fills a specific role: assault, medic, support, or trapper. I played in the assault role, which has the most straightforward assignment as the team’s primary damage dealer. The trapper is arguably the most valuable, charged with encapsulating the monster in a containment field and preventing it from fleeing, hiding, or leveling up in peace. Evolve is a first-person shooter, but it unexpectedly plays a bit like a racing game. Much of a match is spent doggedly chasing the creature by following an alien bloodhound who can sniff out its scent or by tracking its glowing footprints to discover its wayward path across a vast network of caves. It’s possible that my razor-thin victory was an anomaly, and that most matches with human opponents aren’t so well-balanced. But from what I saw, each moment in Evolve feels infused with enough drama and tension that spontaneous virtual high-fives are bound to erupt afterward.